The Center for the Study of Race, Politics and Culture was established by Michael C. Dawson, with a founding conference taking place in June of 1996 entitled, “Race and Voice: Challenges for the 21st Century.” From its inception, CSRPC faculty affiliates, students, and staff have been committed to establishing a new type of research institute devoted to the study of race and ethnicity, one that seeks to expand the study of race beyond the black/white paradigm while exploring social and identity cleavages within racialized communities. Scholars affiliated with the Center have also endeavored to make race and ethnicity central topics of intellectual investigation at the University of Chicago by fostering interdisciplinary research, teaching, and public debate. Fundamentally, the Center is committed to contributing intellectually challenging and innovative scholarship that can help people transform their thinking and their lives. Towards those goals, the Center provides funding and other types of support for projects initiated by faculty affiliates, graduate students, undergraduates, artists-in-residence and visiting fellows. After extensive renovations in 2013, our building now features seminar rooms to host classes and workshops, space for our events and community activities and other resources. The Center supports and sponsors a number of public programs geared towards promoting an investigation of the ties between race, ethnicity and culture. These events are often co-sponsored with University of Chicago Registered Student Organizations (RSOs), other campus centers and academic units, as well as community-based institutions. View our events calendar here, and submit an event to share with the CSRPC listserv. 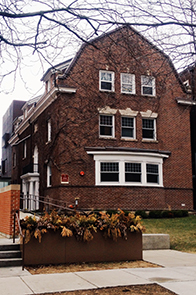 Situated at 5733 South University Avenue, the CSRPC encourages all members of the University and Chicago communities to participate in our current and future development. For regular email updates on CSRPC-sponsored and co-sponsored events, fellowships, and initiatives, sign up for our listserv; for quarterly updates on the work of the Center, view our newsletter here.